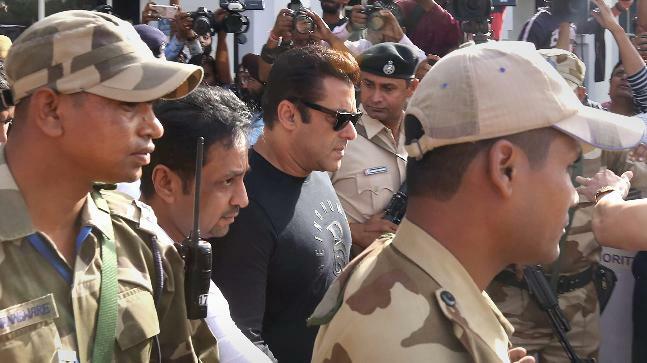 Salman Khan, the khan of Khan, the Bhai of Bollywood, India’s superstar has been sentenced to a 5 years term of jail and a fine of Rs.10,000 by the Jodhpur court today after being proved guilty in blackbuck case. He was accused of having killed 2 blackbucks in 1998 during the shooting of the film Hum Saath Saath Hai, in Bhagoda ki Dhani area of the Kankani village near Jodhpur. Whereas, the other actors of the movie, Saif Ali Khan, Sonali Bendre, Tabu and Neelam Kotahri have been held not guilty due to lack of evidence. The court declared Salman Khan “a habitual offender”. Salman Khan has been held guilty under Section 51 of the Wildlife Protection Act, as per which the maximum punishment is for 6years and minimum 1year. It is the Bishnoi Sabha, a committee to protect the rare blackbucks in Jodhpur had filed the case against Salman Khan and it is today they have achieved success with the Bollywood getting convicted by the Jodhpur court. The court has passed its order only after hearing 28 witnesses which included Bishnoi villagers who claim to have come out running of their huts on hearing the gunshots on 1st or 2nd of October,1998. The villagers assert to have chased Salman’s Gypsy on bike but failed to catch him as he drove so fast. For the last 20 years Salman had been protecting himself by saying that he had just an air gun which isn’t capable of killing and that the deer were killed either by the dogs or by overeating or by any other reason and that he had nothing to do with the deer carcass found on the spot. On the judgement being passed Salman’s sister Arpita Khan Sharma and Alvira Agnihotri who had accompanied BHAI to the court for the gearing, broke down into tears in the court itself with the brave Salman consoling them. Where on one hand Salman’s well-wishers are disheartened, the Bishnoi committee on the other hand was seen celebrating their success outside the Jodhpur court, on the verdict of 5 years jail and a fine of RS.10,000 being passed. Salman’s lawyer said that they are going to appeal in the High Court very soon and are preparing the required paperwork for it.